Elizabeth, Barnaby and Cecilia set sail in the newly named SUNNY from the Belfast Lough Sailability pontoon at Carrickfergus Marina. #sailability – Weather presenter Cecilia Daly performed a weather-themed boat naming ceremony at Carrickfergus at the weekend for a new member of the Belfast Lough Sailability flotilla which was funded by The Lloyds Bank Foundation for Northern Ireland, and Sainsburys. The yellow-decked, orange-sailed Hansa 303 was appropriately named Sunny. 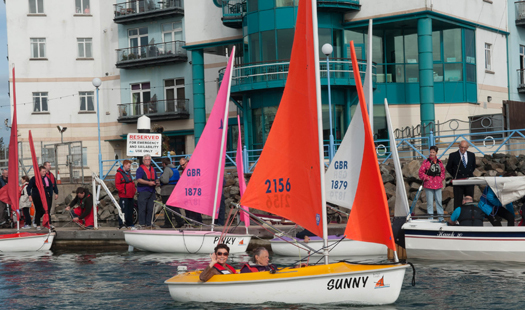 Next summer, with assistance from Carrickfergus Marina and Carrickfergus Sailing Club, "BLS" will host the Hansa 303 Irish Championship for sailors with disabilities – August 1 & 2.